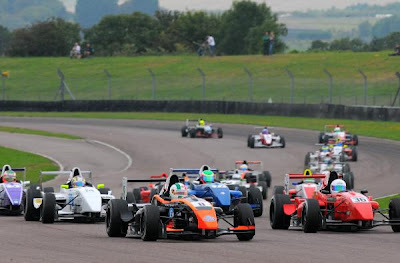 Antel Motorsport’s Dino Zamparelli (Bristol) produced a perfect double race winning performance just when he needed to at Thruxton on Saturday, 3rd September, during the penultimate event of the 2011 Protyre Formula Renault BARC Championship. Leading the driver standings by a single point heading into the weekend from Fortec Motorsport’s Josh Webster (Stowmarket, Suffolk), Zamparelli’s lights-to-flag victories in rounds nine and 10 of the season mean he has increased his championship advantage to 19 points. Locking out pole position for both races at the Hampshire speedbowl, Zamparelli was untouchable in each outing and sealed quite possibly his best weekend ever with the fastest lap in both encounters to add yet more points to his tally. At the beginning of round nine, he got away cleanly from pole position but the most sensational start was by Scorpio Motorsport’s Kourosh Khani (High Wycombe) who leapt up from the third row of the grid to grab second into the complex ahead of James Thorp (Evesham, Worcestershire), the hugely impressive Matt Mason (Nottingham) and title challenger Webster. Unfortunately for the Iranian though, he was over-turned by Thorp on lap three and seemed to struggle thereafter as he slipped to ninth. MTech Lite’s Thorp came under pressure from Webster but that was alleviated at mid-distance when the Safety Car was deployed after Zaamin Jaffer (Milton Keynes) made contact with Jack Dex (Daventry) at the exit of the complex. Dex locked-up leaving the Indian-born racer with nowhere to go and the resulting accident led to significant damage. Although marshals did their best to clear the track, it couldn’t be done in time for racing to resume and so the action was annulled and a result declared after eight laps. Behind third placed Webster, who raced very well to fight his way onto the podium after a less than spectacular start, finished star of the weekend Mason. The MGR Motorsport driver, whose previous best finish in his rookie year was sixth, qualified an outstanding third fastest and posted the second fastest race lap on his way to a career best fourth – even better would follow in round 10 though. Steven Durant (Oxford) steered his RPD Motorsport car to fifth with the top six rounded out by David Wagner (Glasgow) for MGR on a great day for the fledgling squad – the youngster sealing his best result of the year with an excellent drive from 10th on the grid. Other than the unfortunate Jaffer and Dex, Scorpio’s Hector Hurst (Lymington, Hampshire) came to grief on lap one, as did Spain’s Victor Jimenez after a major moment at the chicane. Archie Hamilton (Hook, Hampshire), meanwhile, saw his championship hopes ended after an opening lap puncture. Zamparelli (8) is dominating FRenault BARC - Remember the name. Pole position starter Zamparelli ran untroubled to his second win of the weekend, and fourth of the season, in round 10 with a huge four second winning margin and with Mason again delivering superb pace he made his front row start count with an outstanding second place finish. Once again posting the second fastest lap, just 0.3 seconds shy of Zamparelli’s best, the first year Protyre Formula Renault BARC racer made it a dream weekend for MGR. In doing so Mason has climbed into seventh in the driver standings, having begun the event in 10th place. Webster finished third once again, his seventh podium from 10 races, to keep his title ambitions on course and increase his points gap over Thorp. Although pleased to be on the rostrum in both races, Webster was nonetheless disappointed with his starts this weekend which prevented a victory bid. Durrant concluded his best weekend since the season opener at Donington Park with a strong fourth place, rising from seventh on the grid, ahead of Khani, Hamilton, Thorp and Hurst. 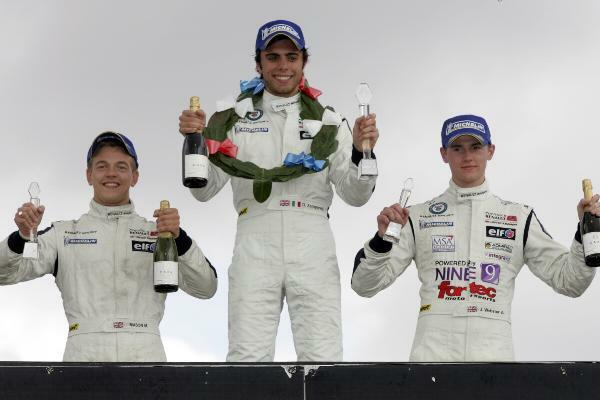 Kieran Vernon (West Chiltington, West Sussex), meanwhile, wasn’t in action due to a clashing race in the Porsche Carrera Cup GB Championship at Knockhill in Scotland but he still retains sixth in the points. Rounds 11 and 12 of the Protyre Formula Renault BARC Championship, the final event of the 2011 season, will take place at Silverstone National Circuit in Northamptonshire on 15th/16th October as support to the British Touring Car Championship. As things are currently scheduled, the second race will be screened live on Freeview, digital satellite and cable channel ITV4 and on ITV4 HD.